0.0.1 Downtown Raleigh Districts Tap top right icon to enlarge. Downtown Raleigh Districts Tap top right icon to enlarge. If you enlarge the map above, you will see Downtown Raleigh broken into 5 commonly referred to districts: Capital, Fayetteville Street, Moore Square, Warehouse, and Glenwood South. It helps to keep in mind that the 2 Northernmost Districts, Glenwood South and Capital , are separated from the other 3 by Morgan Street, which to the east of the Capitol eventually becomes New Bern Ave. See godowntownraleigh for a summary of the Downtown area and what is in each district. Part of Glenwood South is in the Hillsborough neighborhood. This area of Glenwood South has a number of midrise condominium projects which are a few blocks walk to Cameron Village and Glenwood South restaurants, shops, and other services. Paramount Condominiums at Boylan Ave. and Johnson St. The Paramount is located at 618 North Boylan Ave. There are 81 units ranging from 779 to 2963 square feet. Triangle MLS shows both 2005 and 2006 as years built. Amenities include a fifth floor pool, a fitness center, and a gathering room. Triangle MLS shows 7 sales in 2015 with market times of from 19 to 483 days, with an average of 124 days, and a median time of 69 days. (3) 1- bedroom, 1- bath units ranging in size from 752 square feet to 926 square feet that sold from $232,000. to $254,750. (4) 2- bedroom, 2 bath units 1,080 SF to 1,305 SF sold for $270,000 to $355,000. 510 Glenwood Avenue has 36 units 929 to 2200 square feet in area. Triangle MLS shows the year built as 2000 and that there were 3 sales in 2015. (1) 1- bedroom, 1- bath unit of 906 square feet sold for $226,000. (2) 2- bedroom, 2 bath units sold, one of 1217 SF for $329,900, and one of 2,111 SF for $ 460,000. Two of the (3) sold for list price. The 2,111 SF unit had an approximate 7% price reduction. For the 3 units, the median time was 4 days, but the average was 274. This was apparently due to the 2111 SF unit having 818 days on the market with the other two selling quickly. 222 Glenwood Condos, Looking South. The 222 Glenwood Avenue page of The Preston Partnership site describes the building as a 7 story mixed use project with 6 residential floors providing 125 one, two, and three bedroom units. The building has 17,000 SF of retail space and a 420 space deck. There is an amenity floor above the deck with a landscaped plaza and a pool. A fitness center is on the ground level. It was developed by Trammell Crow Residential. MLS listings show both 2007 and 2008 as year built. (3) 1- bedroom, 1- bath units ranging in size from 722 square feet to 860 square feet which sold for $182,000. to $216,000. (12) 2- bedroom, 2 bath units of 1,224 SF to 1,486 SF sold for $295,000 to $365,000. Bloomsbury Estates Condominium from Hargett St.
Bloomsbury Estates, South Elevation. From Boylan Ave.
Bloomsbury Estates Condominiums, 710 Independence Place, also are at the southwest corner of Boylan and Hargett. They are a nicely detailed seven-story brick building just north of the Boylan Ave. Bridge. The site has a panoramic view of the Downtown Raleigh area. A second similar building was planned for the site. The end of June 2015, the Triangle Business Journal published that the NC Dept. of Transportation needs a part of the land for the Raleigh Union Station project, so the second building which would be similar to the existing 55 unit building is unlikely. Triangle MLS shows 9 sales closed in 2015. The number of days on the market ranged from 24 to 272, the average being 106, and the median 96. 3 sales were for 1 Bed., 1 Bath units of about 875 square feet with sales prices from $225,000. to $240,000. 3 sales were for 2 Bed, 2 Bath units of 1240 to 1,500 Sq. Ft. with sales prices from $299,000 to 435,000. One 3 Bed, 3 1/2 Bath unit of 2,400 SF was listed for $799,000. and sold for $765,000. “With a key location just across Hillsborough Street from what is now N.C. State University, and on a streetcar line just a 10-minute ride from downtown, it started life in 1910 as Raleigh’s most expensive suburb. 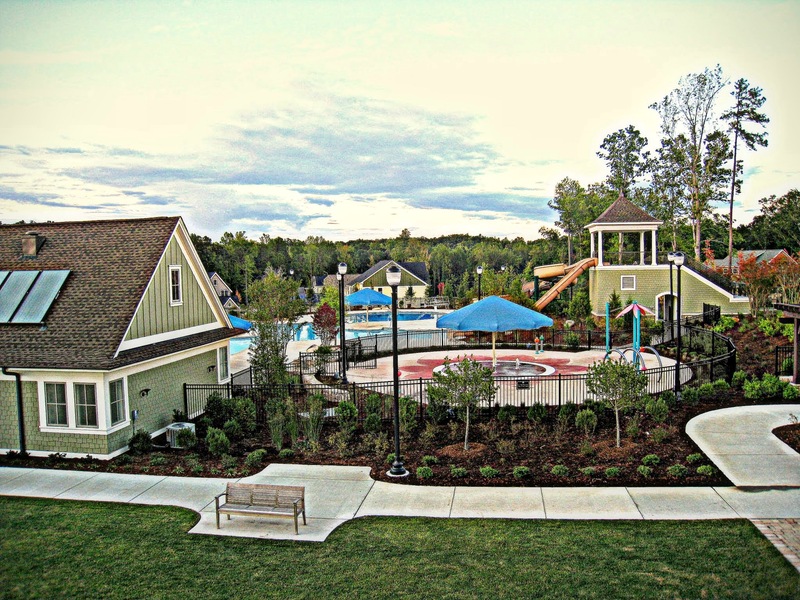 A search of the Triangle MLS showed 14 closed sales in Cameron Park subdivision for 2015. Days on the market ranged from 0 to 105, with the average being 21 days, and the median, 8 days. Starting prices were for a 1992 SF house on Johnson St. that was listed for $392,000 and sold for $23,000 more, at $415,000. At the other end of the range, a 3,370 SF house on Hawthorne that listed for $1.1 million sold at a $70,000 discount to bring $1,030,000. Of the 14 sales, 5 were over $600,000. Of these, one sold for $1,000 over asking, and the rest were discounted $44,000 to $70,000. In contrast, of the 9 sales under $600,000, five were at full price (2) or higher (3). All except 2 houses were built in 1940 or before. The newest was on Park Drive built in 1965. The oldest 2 were built on E Park Drive in 1909. Cameron Village is an early planned development that includes the shopping center, and multi-family and single family homes surrounding it. I like the fairly concise history of Cameron Village provided by The North Carolina History Project. If for no other reason, two generations of the developer’s family (J.W. York and G. Smedes York) and their associates had a hand in its authorship. A short ride through Cameron Village provides plenty of evidence of the vitality of the area. There are two recent midrise residential buildings seen below, and another under construction a couple of blocks down Oberlin. The drug store building is being redeveloped. A ride through the neighborhoods shows the results of renovation and rebuilding. These single family homes lie between Cameron Village Shopping Center and Wade Avenue. The shopping center is a few blocks to walk. Many of the lots are generous in size. A ride through the neighborhood reveals a mix of old, new, and remodeled. There are some contemporary architecturally interesting homes both renovated or built. This is a very convenient Inside the Beltline location. Wade Avenue gives quick access to the Beltline and Capital Boulevard. Motor Court and Entry from James St. Per Triangle MLS, there were 5 Cameron Village sales in 2015. Days on market ranged from 2-95, and were 34 days average, and 9 days median. Sales were from $295,000 for a 984 square foot home on Parker St. to $430,000 for an 1,829 SF home on Sutton Drive. Both of these sales closed at above list price. None of the others did. In addition to Bloomsbury Estate Condos, Cameron Park, and Cameron Village, The Hillsborough Neighborhood shown outside Downtown includes NC State University and Saint Mary’s School. The North Central Raleigh TMLS neighborhood shown in blue on the interactive map includes part of the Glenwood South Downtown district at its west edge. In or on the perimeter of this area is West and Harrington Streets where the ” West at North” and ” Residences at the Quorum” condominiums lie. Looking East on Jones Street at Residences at the Quorum Background Rt. The West at North is located at 400 W. North Street. godowntownraleigh has a map and basic information about this condominium and indicates residences are 700 to 1900 square feet. A story in bizjournals.com detailing development plans in the immediate area indicates that there were 170 units when this condominium opened in 2008. (5) 1Bed , 1Bath of 718-1,037 Sq. Ft. from $217,000 to $260,000. (4) 3 Bed, 2 Bath of 1571-1887 Sq. Ft. from $538,000 to $630,000. The 203 unit Gramercy Apartments under construction on Glenwood Ave. and West St. are shown in the background of the middle photo. There was a 2016 announcement of the acquisition of a significant tract of land where West and Harrington Streets come together by two local developers. I really don’t intend this as a complete list. The point is that Glenwood South and nearby areas are a major focal point of residential development. Living here has become and will continue to develop as a much more urban experience with walkable restaurants, services, and retail shops. On West Street, just inside the southeast corner of Glenwood South is the Roast Grill. Here is the menu: Hotdogs. Condiments- mustard, onions, chili, or slaw; Texas Pete, salt and pepper on the counter. Soft drink or beer in cans. Baklava when they have it. No ketchup, not even in the back for whiners. George mans the grill. I remember his Grandmother there before him. Man vs. Food did a show there, and Adam did best the existing record. Moving east of Glenwood South, much of the center of the North Central neighborhood coincides with the “Capital” Downtown district running from N. Harrington St. to East St. A large portion of the neighborhood is taken up by the NC government complex (its most famous resident being the Governor) and to the east is a portion of Historic Oakwood. I think of Oakwood as being the area where historic preservation got its first big foothold in Raleigh. That may be arguable; it’s just my perception. When people rediscovered this neighborhood and renewing the homes, Oakwood began holding a candle-light tour around Christmas. My experience was that the cold candle-lit evenings made it feel like the time the neighborhood was originally built in the 19th Century. I’m certain it caused a lot of people to love Oakwood. The community has significant depth, and a walk of all its streets would be lengthy. Check out the historicoakwood.org site, and you can get a good feeling for what it would be like to live in this neighborhood. In addition to discussing current events, there is an inventory of houses that was submitted to the National Register of Historic Places, and a truly educational (it was for me) discussion of the styles of architecture there. Triangle MLS sales information for 2015 shows 7 houses sold with market times ranging from 2 days to 158 days. The average time was 52 days, and the median was 11. Recently Opened Holy Trinity Anglican Church-Peace and Blount Streets-I chose the less ornate rear elevation to show the church setting and for its uncluttered contrast with its surroundings. I think what strikes me about a News and Observer story written about the opening of this church in 2015 is that it is the first church built in the Downtown Raleigh area in over 50 years-since the Edenton Street Methodist Church lost in a 1956 fire was replaced in 1958. I’m not really sure what part of the congregation lives in the area, but still, they built it here. This looks like wide open space, but it is just across from the William Peace campus near the end of the government complex, and is just a few blocks from Oakwood. This is the rear elevation. It’s construction is another piece of evidence of the new energy Downtown Raleigh has. What Appears to be a Repurposed Filling Station on the Periphery of Oakwood. Got to Love a Sense of Humor. Part of the North Central Raleigh Neighborhood lies east outside the Downtown Raleigh area and includes the balance of Oakwood, the Oakwood Cemetery, and St. AugustinesUniversity. Mordecai is sometimes thought of as being downtown. It is just north of the North Central Raleigh neighborhood, and is covered as “Inside the Beltline” . Park Devereux at 200 S. Dawson St.was completed in 2000 by White Oak Properties. The front elevation faces Nash Square, which assures the continuity of its park setting. parkdevereuxcondos.com shows that there are “46 condominiums, including multilevel lofts and single-level flats.” Click on the link for a more complete description of this property. The Triangle MLS shows two sales for 2015, both 2 bedroom, two bath of 1295 and 1298 Sq. Ft. Both were listed at $279,900. One sold for that and one, for $1,000. less. Apparently one was on the market for 2 days, and one for 27. The Warehouse District is the home of Citrix, pictured at the top of the page. This information is from Wikipedia: The building is located at the corner of Martin and Fayetteville Streets. It stands 538 feet high, and is the tallest in Raleigh. There are approximately 730,000 square feet of office, retail, residential, and parking space. Dominion Partners of Raleigh partnered with the developer of the (now) PNC Bank to build 139 residential units above the office space. This brought the building to 33 floors. MLS listings show 2008 as the year built. Triangle Multiple Listing Service Data shows there were 12 sales at PNC Plaza in 2015. Market time ranged from 0 to 279 days, with an average of 77 days, and a median time of 49 days. Sales ranged in price from $290,000 for an 887 SF 1 Bed, 1 Bath unit, to $850,000 for a 1998 SF 3 Bed., 3 Bath unit. City Market in Downtown Raleigh Moore Square District. SkyHouse Apts. Palladium Plaza at 444 S. Blount St. is located on the west side of Blount Street, and runs the length of the block from Cabarrus to Davie Street. There are 65 residences developed by White Oak Properties. They also developed Park Devereux in the Warehouse District, shown above. Founders Row was built by an early Downtown Raleigh redevelopment pioneer across Davie Street from Artspace. There is an attractive interior courtyard around which the residences are arranged. Godowntownraleigh.com lists the address as 200 E. Davie St. and indicates there are 48 total units ranging from 1102-1449 SF. The Triangle MLS shows the property was built in 1986. There was a single sale in 2015 of a 1440 SF Condo with 2 Beds., 2 1/2 Baths. It was listed at $260,000. and sold in 5 days for $263,500.